Every Monday night is DIY @the Teen Scene. 6-8 pm will find us crafting, cooking, adulting, and discovering all manner of Doing-it-Yourselfery. March 2019’s calendar includes perler beading (3/4), creating smart phone covers and other techy craftiness (3/11), and stop motion animation (3/25). On March 18—that’s right! Day 1 of Spring Break! !—we’re having a special DIY: Multicultural Cooking Class. It starts at 4 pm instead of 6, so we’ll have plenty of time to cook REAL FOOD and EAT IT! Since it’s the day after St. Patrick’s Day, we’ll be exploring Irish culture. Nope, not green food. This is the real thing. We’ll be making colcannon and soda bread. Trust me, it’s tasty, and the teens will be the chefs! Be here on time so we can get our teams together and get busy. If you want to put together your own teams of 2-4 individuals, just let us know at the desk in the Teen Scene or send us an email at eday@rogersar.gov or kwright@rogersar.gov. 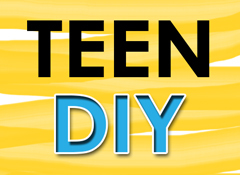 RPL’s Teen Scene DIY replaced Monday night’s Crafty Teen Crew. While we still include crafts, the new program focuses on more practical Do-It-Yourself applications. Cooking is a monthly occurrence in the Community Room. Past programs include creating chocolate confections for Valentine’s Day and creating hot chocolate kits for December holiday gifts. Participants learn practical cooking skills and get to eat or share their creations. Other activities may take place in the Teen Scene. In January we explored how to make our planners more personal and productive. We’re celebrating Teen Tech in March with crafty DIY projects for our personal tech (like cell phone covers) and using tech (like your cell phone) to create stop action animation. March may be techy, but April will be something completely different. Make sure to pick up each month’s Teen Scene Events Calendar at the desk or check out our events online. We have so much going on, you’re sure to find something that’s just for you. The teen librarians are also all ears about YOUR ideas, too, so come talk to us and make a suggestion!